A new report: Climate Change in Queensland: What the science is telling us was released this week by the Queensland government with much fanfare. It’s a long, detailed, and informative report produced by the Queensland Climate Change Centre of Excellence. It makes alarming claims which have been repeated and discussed in many other forums. It relies in part on the State of the Climate Report of March 2010 by BOM and CSIRO. Their predictions for rainfall have been ridiculed already (e.g. Political Science 101 ) and if the Queensland Climate Change Centre of Excellence relies on BOM’s High Quality temperature record, I have one word of advice: DON’T! I will examine just one of the claims in this latest report: sea level rise, and leave the reader to ponder the logical processes involved in accepting this. The report, quoting The Science of Climate Change: Questions and Answers published in August 2010 by the Australian Academy of Sciences says that sea levels in Queensland have been rising since 1920 at the rate of about 1.2mm per year. 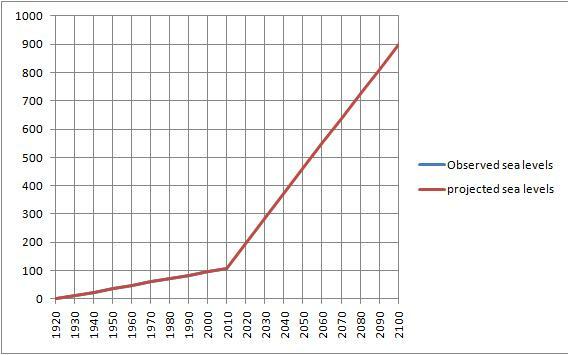 Then on page 28 we are informed that Queensland is currently using 0.8 metres as the projected sea level rise by 2100. 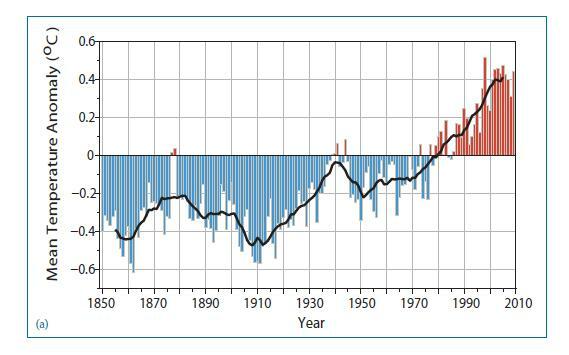 In the same report, on page 17, they show the global land–ocean temperature record from UK Met Office Hadley Centre (HadCRUT3) between 1850 and 2009. By the way, in today’s Weekend Australian, there are quotes from the official briefing from the Department of Climate Change and Energy. One of the quotes is: “The rate of global warming over the past 50 years of approximately 0.13 degrees Celsius per decade is about 100 times faster than the warming after an ice age.” Have a look at the graph above and compare the rates of warming. 1960 -2010: 0.13 C per decade or 0.65 C over 50 years (as you can see it’s actually less- 0.6 C over 60 years! ); 1860-1875: about 0.2 C over 15 years- much faster! Again, 1910 – 1940: about 0.4 C over 30 years is the same as the rate claimed for the last 50 years. There have been two additional phases of global warming equal or greater than the recent phase. It seems you can’t trust anyone these days. 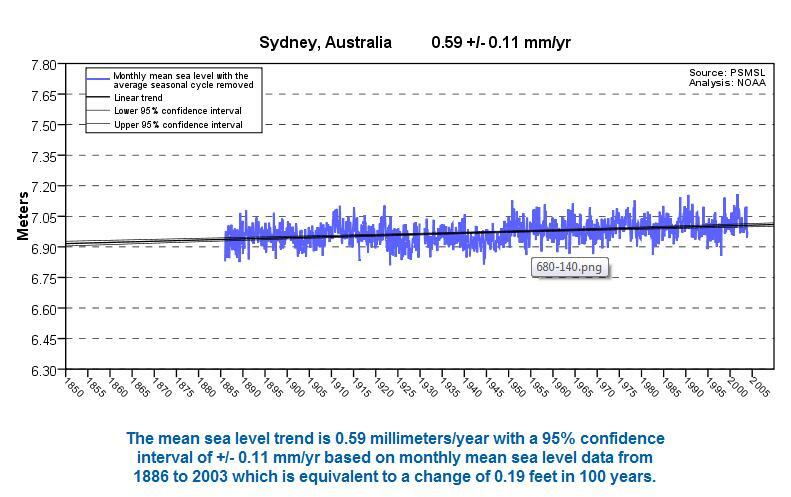 So let’s compare the “official” temperature record with some Australian sea level data. First, Townsville. This is the official chart of sea level rise from NOAA. 1.1mm per year- just slightly less than 1.2mm. Has there been recent acceleration? Nope, looks pretty much the same, may even have lowered a little. But Townsville’s data is only from the 1950s. Let’s look at a longer record, say Sydney, since the 1880s. Even less- 0.59mm per year! And absolutely no sign of any acceleration. And no sign of link with temperature. 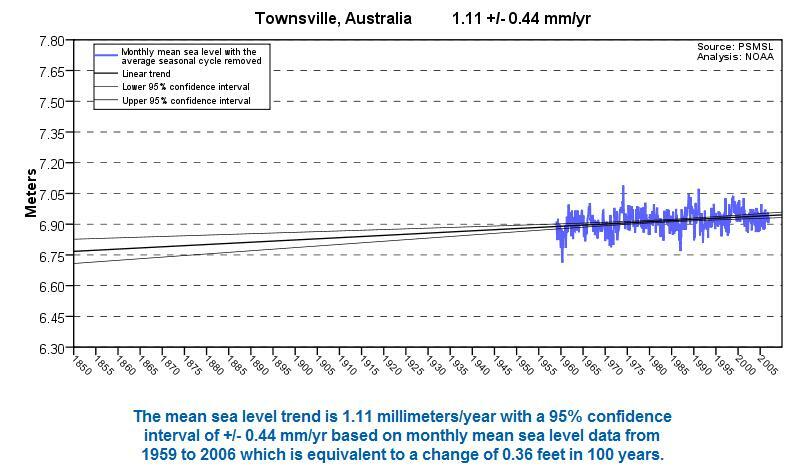 So, if my grandchildren are going to see this 0.8m rise in sea level along the Queensland coast, there will have to be a very rapid increase very soon. If there isn’t, the Australian Academy of Sciences, CSIRO, and the Queensland Climate Change Centre of Excellence will have considerable explaining to do for their scare mongering. But they’ll be long forgotten. You are currently browsing the kenskingdom blog archives for October, 2010.